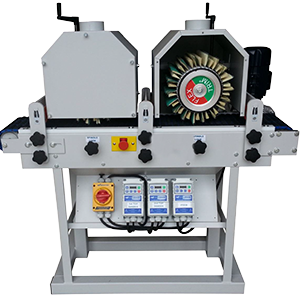 The 240 Series Profile Sander is a two spindle machine designed for use with flexible brush type sanding wheels. The motors tilt from vertical through horizontal positions. 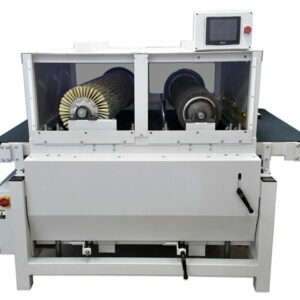 In the horizontal position, it can be placed at the out-feed end of a moulder to sand parts as they are exiting the machine, above a conveyor to sand moldings or other long parts, over a table, or used to sand free-hand. In the vertical position, parts can be sanded free-hand, or, a table may be placed in front of the machine, allowing parts such as cabinet doors and fronts, plaques, or other parts with edge profiles to be sanded. The spindles are counter- rotating, allowing corners to be sanded without rounding over, to sand in two directions, or use different grits. 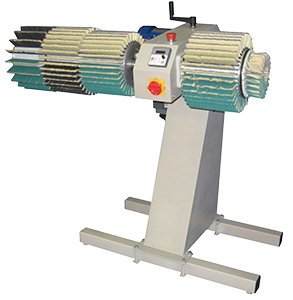 Motors are controlled by inverters giving variable speed. 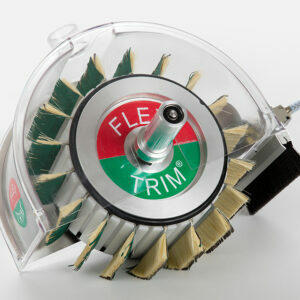 The 240 Series features two counter-rotating spindles to be used with brush type sanding wheels from Flex-Trim. This type sanding wheel conforms to a profile as the parts are pressed into the sanding wheel. 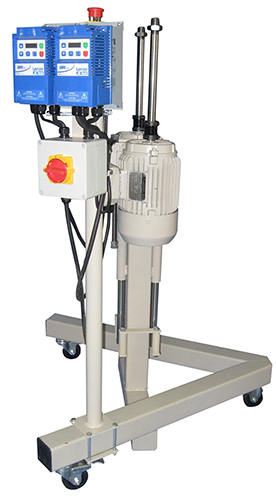 The 240 has 18 inches of vertical adjustment, which allows the brushes to be placed above or below parts exiting machines, being transported on conveyors, or fed across tables. Dual inverters allow the motors to run in sensor-less vector mode, giving excellent speed regulation. The inverters and disconnect switch pivot and/or slide up and down on the mount. The mount can also be moved from one side to the other to provide clearance for various setups.